WITH ONTARIO TIRE STEWARDSHIP'S PENDING DISSOLUTION, WHAT WILL HAPPEN TO END-OF-LIFE TIRES IN THE PROVINCE? Into the shredder: the 25-millionth tire to be recycled at Emterra Tire Recycling, Ontario, an OTS program participant and member of the Canadian Association of Tire Recycling Agencies. Earlier this year, it was announced that Ontario Tire Stewardship's Used Tires Program had reached a significant milestone: the recycling of its 100 millionth tire since the program began in 2009. Alberta is the only other Canadian province to achieve this milestone. Before the implementation of the Ontario program, many of the province's tires ended up in landfills or accumulated in tire piles. Because of Ontario Tire Stewardship's (OTS) Used Tires Program (UTP), 100 percent of scrap tires generated in Ontario are currently recycled into high value, sustainable products - and importantly, no tires are burned, disposed of in landfills or illegally dumped. OTS has also established a tire recycling network of over 700 stewards, 7,000 collectors, almost 100 haulers, and a group of 30 processors and recycled product manufacturers with the goal of building a sustainable future for Ontario and supporting the circular economy. Used tires in the province are now being redesigned into eco-friendly products including patio tiles, rubber landscaping mulch, gym flooring, playground surfacing, floor underlay and more. OTS has also invested more than $100 million into the Ontario economy through research and development, and into new markets that have led to the creation of hundreds of jobs. Additionally, through the OTS Community Renewal Fund (CRF) grant program, a total of 60 projects have been awarded over $1 million in funding for new and need-to-be-renewed public spaces, like playgrounds and fitness tracks. Despite all of their success, OTS will cease to operate as of the end of 2018. In November 2016, the Government of Ontario passed the Waste Free Ontario Act (WFOA, Bill 151) which began the process of revising the waste diversion policy framework in Ontario by repealing the Waste Diversion Act and setting the stage to transition existing stewardship plans to an Individual Producer Responsibility (IPR) model under the Resource Recovery and Circular Economy Act (RRCEA). On February 17, 2017, the Ontario Minister of the Environment and Climate Change (MoECC) issued direction to OTS to develop a wind-up plan for the Used Tires Program. This plan is to be submitted to the Resource Productivity and Recovery Authority (RPRA) by October 31 this year, with the UTP to be fully wound-up on December 31, 2018. In consultation with various stakeholders, including an industry consultation session at the recent Tire and Rubber Recycling Association summit in June, OTS is now working on developing the wind-up plan as directed by the MoECC. We talked to Andrew Horsman, OTS executive director, about the organization's successes and mandate for the UTP wind-up and closure, and about what it means for tire recycling in Ontario. RPN: Tell us more about your milestone of 100 million tires recycled in Ontario. Andrew Horsman (AH): It really is a testament to our commitment to making sure we maintain used tire diversion rates at the current high level, and that consumers are buying into the notion that there is a life for scrap tires, and that they are an important part of the solution. Back when we launched this program in 2009, consumers' interests were really about ‘How do I get rid of my scrap tires? What is OTS going to do about the tire piles? And how are you going to eliminate new illegal dumping?' And so, we focused on those issues very early. More and more, what we saw through our engagement with consumers, either through social media or industry events, is that they are interested in what happens to the scrap tire. Where does it go? How does it get recycled? And what is my opportunity to participate as a consumer of those products? And so while the hundred million is an impressive number, I think the story that is even more interesting is really about the growth of a domestic manufacturing industry that is using recycled tire material to make high-value, sustainable, high-performing products that consumers are interested in. RPN: What can you tell us about OTS' success in end market development for recycled tires? AH: In the early days, it was about building capacity, but for some time now it has been about developing markets that have the capacity and wherewithal to stand on their own. Our focus at OTS has always been on developing markets that are beyond the commodity stage. When we launched our program, we had a number of goals. Our first goal was to make sure all of Ontario's tires were getting recycled; none of them were being sent for tire-derived fuel or alternative daily cover and landfill. We did that fairly quickly by setting up service contracts with both in-province and out-of-province recycling suppliers. Our next goal was to really start moving tire recycling in Ontario up the value chains. That started with us working with the Ontario industry to develop enough capacity to manage all of Ontario's tires, which meant we had to double capacity, more or less, in the province. We hit that milestone in 2012, when capacity was enough to manage all of Ontario's scrap tires. Our focus since then has really been on building markets domestically for recycled rubber, and that takes a number of forms. 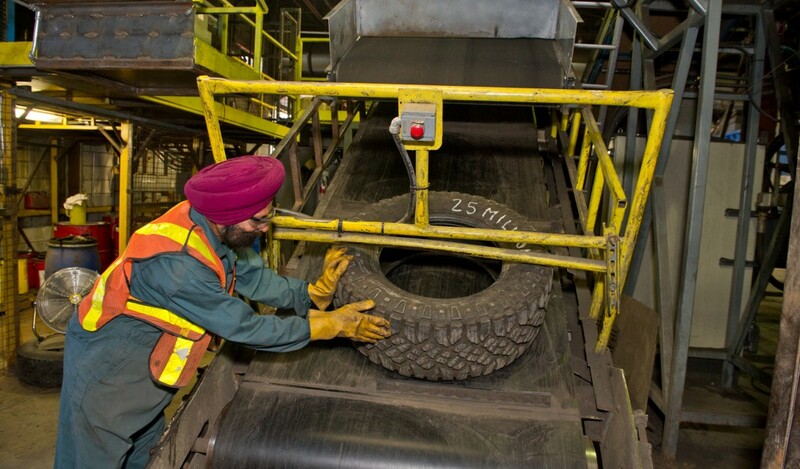 We work with Ontario-based manufacturers - companies that take recycled rubber and either mould it or blend it with plastics or other rubbers to make finished goods in the province - and have supported further innovation for the use of scrap tires through our research and development grant program. We're focused right now on trying to develop the rubber-modified asphalt market in Ontario. And we've also got a number of programs, such as our Retailer Rebate Program where we work with retailers, and others, in trying to incentivize consumer behaviour, to encourage Ontario's consumers to buy Ontario-made recycled rubber products. As well, through the OTS grant program known as the Community Renewal Fund, 60 community projects across the province have been awarded funding for new and need-to-be-renewed public spaces, like playgrounds and fitness tracks, further encouraging environmentally friendly building while boosting the Ontario economy. All of those initiatives are about trying to maximize the value of recycled material to create a self-sustaining industry. We have also worked to develop the wherewithal within the recycling industry in Ontario to be able to supply those markets, which means building capacity. That means improving the tire recycler's efficiency and supporting them to be able to invest in their own operations, to make better, more consistent product, and on a more consistent basis. Because that is what those markets demand. It's also about creating manufacturing industry consumers as well. Our mandate has always been very Ontario-centric. We've tried to create solutions in the province to manage recycled tire material, but the reality is that recycled tires is a North American market, not only for commodity material, but also for manufactured goods. So when we have a manufacturer that makes outdoor living products, whether it's flooring or planting pots, for example, their customers are all over the continent. You want diversified markets, but we also want to benefit in the province by using recycled rubber product wherever possible. RPN: How will Bill 151 (the Waste-Free Ontario Act) affect the tire recycling industry in Ontario? AH: The legislation that's been passed - the Waste-Free Ontario Act, Bill 151 - will fundamentally change how tire, as well as paint and electronics, packaging and printed materials stewardship works in the province of Ontario. Under the old legislation - the Waste Diversion Act - it led to the creation of one entity, OTS, to manage diversion services for the province. In today's system, OTS is the entity responsible for diverting tires, managing tire recycling for all of the tire producers and other suppliers of tires and delivering these programs in a centralized fashion. We are the ones who are accountable to the Minister and our oversight body. The new legislation will fundamentally change that, so the obligation to divert material will not rest with one entity, like we are today. It will accrue to the individual companies supplying the manufactured products [the source of tire waste]. In the new legislation, individual companies such as Bridgestone, Michelin, Ford, Toyota, Canadian Tire, etc., will be the ones who are legally responsible for achieving diversion. How they choose to do that, whether on their own or by joining some sort of collective group, will be up to them. And so the consequence of Bill 151 for OTS is that as of December 31, 2018, our used tire program as we currently deliver it will cease to operate. Tire manufacturers will take over the responsibility as of January 1, 2019. It means OTS will cease to exist. Sometime in 2019, when we finish our remaining work, Ontario Tire Stewardship, as a corporation, will be wound up. This last legislative review and change is basically the government's third attempt at reworking waste diversion on Ontario. It's not entirely surprising to us that it went this way. They're certainly charting new territory. No other jurisdiction in Canada is pursuing this kind of legislative approach. To my knowledge, no other jurisdiction in the world has done what they're doing here: where they've built one system, and then they're going to tear that down and mandate the building of a new system. This change is creating uncertainty in the market. The finalization of the Regulation, followed by the producers beginning to develop their approaches to diverting tires, will eventually reduce this; however, at present, in the absence of these important elements there is a disruptive impact. Our job at OTS is to work to ensure stability and continue our high diversion rates from now until the end of 2018. RPN: What will happen with end-of-life tires once the OTS wind-up is complete? AH: My personal view is that of course tire diversion will continue to happen in Ontario. There will probably be two or three smaller versions of OTS out there, as well as some individual companies who might decide that they can do it on their own. They will contract directly with recyclers to ensure that tires get recycled in accordance with their legal obligation. How will some of our larger, more strategic market development initiatives - like rubber-modified asphalt, consumer rebates, and our research and development branch - be delivered in an environment where you have multiple, competing programs? That's not clear. It's also not clear what the obligations will be around this. Because the government hasn't yet written the new regulations. But that will come, and they are starting to consult on it. From the government's perspective, they are not trying to lay out a prescriptive path. They are trying to give choice to the Michelins, the Goodyears, the Toyotas and other tire producers. At a high level, that's not a bad thing. Giving them choice in terms of how they meet their obligations is a tough thing to argue against. I think they should have a choice. I think the government's view is that if the producers, the tire producers, tire stewards, decide that they want to create one company on the other side to which they'll all subscribe, that option is not precluded to them. I think what they may have underestimated, although they're getting more immersed in it now, is the degree to which going from OTS to that new framework might create uncertainty and disruption in the market. This article was originally published in Recycling Product News, September 2017, Volume 25, Number 6. Tires waiting to be shredded at OTS recycled product manufacturer Moose Creek Tire Recycling. Ecolomondo Environmental, a subsidiary of Quebec-based Ecolomondo Corporation has secured an amount of CAD 32.1 million in project financing from Export Development Canada (EDC) to build a new, first of its kind turnkey Thermal Decomposition (TDP) facility that will be located on Tessier Street in the Town of Hawkesbury, Ontario. The U.S. Tire Manufacturers Association (USTMA) has released its first U.S. industry sustainability report presenting its members' collective progress and shared vision for a sustainable U.S. tire manufacturing industry. The California Department of Resources Recycling and Recovery (CalRecycle) based out of Sacramento, has issued grants totalling nearly $11.1 million to 31 communities and nine businesses to fund projects to reuse and recycle waste tires. CalRecycle announced the grants January 4 under its Tire Incentive Program and its Rubberized Pavement and Tire-Derived Aggregate grant programs. Goudsmit recently built two magnets to be used for the production of iron-free carbon black by a large European manufacturer. These self-cleaning, rotating magnets remove iron particles as small as 30 microns from the very dry, poorly flowing conductive carbon black used for lithium-ion batteries.It is essential that this product is 100% metal-free, because metal particles would change the conductivity. In this line, the rotating magnets process at a relatively low capacity of 1500 kg per hour. If necessary, however, such magnets can process at capacities of up to 40 m3 per hour. According to a December article from Canadian Press, the Saskatchewan government says it will spend up to $3.3 million to clean up more than 6,600 tonnes of scrap tires at a defunct recycling plant. CM Recycling Solutions, the manufacturer of tire recycling systems based out of Sarasota Florida, has announced the sale and commissioning of a new turnkey CM whole tire-to-chip system to Badger Materials Recycling. Burlington, Ontario-based YES Environmental Services & Solutions (YESS) is setting out to change the face of recycling in Canada. YESS is run by three experts in the waste management and product stewardship industry, who just happen to be women thriving in a predominately male-dominated business environment. Netherlands-based Cleantech company Black Bear has secured an additional €5 million from Capricorn Venture Partners and Particon, who join an earlier €11 million growth financing round. Using this growth capital, Black Bear aims to scale up its "Tire to Carbon Black" technology, a unique carbonization process used to transform tires into recovered Carbon Black for use in the production of tires, technical rubber, coatings, plastics and inks. The Tire and Rubber Association of Canada (TRAC), the U.S. Tire Manufacturers Association (USTMA) together with Host Sponsor, eTracks Tire Management Systems, are set to host the 2018 Rubber Recycling Symposium, held on November 7-8 at the Sheraton on the Falls Hotel, Niagara Falls, Canada. Every year, 1.5 billion tires reach the end of their life. The vast majority get dumped or incinerated, releasing massive amounts of CO2 and destroying highly valuable resources. To solve this waste tire problem, Netherlands-based Black Bear has developed a unique carbonization process to transform used tires into recovered Carbon Black (rCB). The company has now successfully closed a growth funding round of 11 million Euros to refine the environmentally-friendly process and to start the worldwide roll-out of the technology. This brings the Dutch cleantech company a crucial step closer to bringing the circular economy to tires. The Tire and Rubber Association of Canada (TRAC), the U.S. Tire Manufacturers Association (USTMA) together with Host Sponsor, eTracks Tire Management Systems, are set to host the 2018 Rubber Recycling Symposium, held November 7-8 at the Sheraton on the Falls Hotel, Niagara Falls, Canada. More than three decades into the tire recycling movement, the largest application for scrap tires remains the alternative fuels market. This is for good reason, as scrap tires are a tremendous resource of energy and iron. Major industries consuming tire-derived fuel (TDF) include cement producers, paper mills and energy utilities. Rotating Drum Magnets from Michigan-based Puritan Magnetics, Inc. are designed for continuous self-cleaning of ferrous materials from product flow streams. As product enters the housing inlet, an adjustable feed gate meters the flow of product to the drum face. The drum has a stationary internal magnet with an outer drum that rotates. Over 81 percent of scrap tires are re-used in products such as tire-derived fuel, rubber modified asphalt and other products, according to a report issued by the U.S. Tire Manufacturers Association (USTMA). USTMA is the national trade association for tire manufacturers that produce tires in the U.S.
Columbus McKinnon Corporation, Sarasota Florida a world leading manufacturer of tire recycling systems has sold one of its new Hybrid shredders to Dundee Tyre Group of Carlisle England. CM has numerous installations throughout the United Kingdom however, this is the first of its new Hybrid Shredders to be sold in the UK. Scandinavian Enviro Systems AB (Enviro) has signed an MoU (Memorandum of Understanding) with Treadcraft Limited to establish a new recycling plant in the city of Buffalo, New York. The contracting party, Treadcraft Limited, based out of Wainfleet, Ontario, was incorporated in 2007, and is today active on the North American market. According to Sweden-based Enviro the agreement is valid for a period of 6 months and applies to a recycling plant of minimum 30,000 tonnes of end-of-life tyres per year, and the project has great support from both the State of New York and the city of Buffalo. The ambition is to start the project at the end of this year, according to Thomas Sörensson, CEO of Enviro. Well known Canadian recycling and resource recovery pioneer Emmie Leung announced today that she has launched a new company, Ryse Solutions Inc., that is Canada's first fully integrated producer responsibility organization offering compliance services and material recovery solutions and advice under one umbrella. The Government of Ontario has advanced the province's shift to a circular economy by passing a new regulation designating tires under the Resource Recovery and Circular Economy Act, 2016. When granulating knives for the recycling industry don't perform, or worse, have a catastrophic event, it can result in hours or even days of costly downtime of production lines. Failure of fastening bolts on the knives can result in damage to the more expensive knives and/or recycling processing machines. Resulting from new legislation, Ontario Tire Stewardship (OTS) is scheduled to wrap up operations by the end of 2018. Until then, the organization will continue to maintain a successful recycling infrastructure and manage used tires in the province to ensure they are properly recycled. SEDA's new T-REC XXL is designed to quickly and easily separate tires from wheel rims. T-REC stands for Tire-Recycling, and with this advancement of SEDA's technology, recyclers and other users are assured more power and dimension when processing tires. These units will process about 100 tires per hour, and incorporate unique time saving and safety features. T-REC XXL will process all kinds of tires, including run-flat tires, with both alloy and steel rims, including those found on bigger cars such as: Audi Q7, VW Tiguan, BMW X5, and Mercedes ML. Luff Industries, a Canadian manufacturer of conveyor components, is the first original equipment manufacturer in North America to achieve SKF Equipped status. The SKF Equipped program places strict quality standards on the design, manufacture and assembly of rotating equipment to achieve highest performance. KINSHOFER, one of the world's leading sources of high-quality excavator and loader crane attachments, introduces the DXS Series of hydraulic mobile excavator shears. The line features industry-leading in its size class power-to-weight ratios, jaw opening sizes, cycle times and hydraulic efficiency. The attachment series, which debuts with the DXS-50 model, is ideal for scrap processing, tire recycling and demolition. With high operational reliability and flexible application possibilities, conveyor belts are indispensable for the transport of all types of bulk goods, including recyclable materials. Transportation lines and material streams are important aspects of every production plant. They need to be cost-effective, efficient and above all reliable in continuous operation. A true all-rounder in transport systems for bulk materials is the recently introduced VecoBelt pipe conveyor from Vecoplan. (Washington, DC)- Registration is open for the Institute of Scrap Recycling Industries' (ISRI) Annual Convention and Exposition. ISRI2018, the world's largest annual gathering of scrap recycling professionals, will be held April 14-19, at the Mandalay Bay Resort and Casino in Las Vegas. ISRI2018 is set to provide scrap recyclers from around the world with the educational and networking opportunities, product showcases, and industry news needed to maximize their time, dollars, and return on investment. If you own and operate a shredder, you know that the capital cost of the equipment is just a small part of the story. Shredders, by nature of their operation, require frequent maintenance. Most maintenance time with shredders is spent replacing hooks and knives. SALT LAKE CITY, UTAH — ECO Green Equipment, a global leader in the design and manufacturing of innovative tire recycling systems, has announced the addition of two new sales representatives to their team. There aren't many recycling companies that can say they were the first in their province to lead the way in advancing various programs for reclamation of what would otherwise be waste. For Halifax C&D Recycling, it's a badge of honour they wear with pride. Tires are the foundation of transportation in North America - quite literally. Estimates from 2015 suggest that in the United States and Canada there are around 300 million passenger vehicles on the roads. Some simple math suggests that this number means there are some 1.2 billion tires in contact with road surfaces at any particular time. Currently, the world faces an immensely problematic waste stream: tires. The Ministry of Environment plans to develop new scrap tire recycling regulations to reflect changing industry needs in Saskatchewan and address increasing public expectations for governance, accountability and transparency. Vinh Ngo, the owner of Ideal Rubber Industries Corp., based in Brantford, Ontario, Canada (near Toronto), has been decisive on many fronts. He opted to work with Granutech-Saturn Systems shortly after he set up his recycling operation in 2009, and has subsequently retained Granutech-Saturn as his key vendor in establishing a tire processing system that allows him to convert scrap tires (including large format and OTR tires) into high-quality crumb rubber and powder in a multi-step phased approach. The Institute of Scrap Recycling Industries (ISRI), the Voice of the Recycling Industr, will hold ISRI2017, the association’s annual convention and exposition April 22-27 at the Ernest N. Morial Convention Center in New Orleans. This annual event brings together thousands of scrap recycling professionals, industry experts, manufacturers, and consumers from all 50 states and more than 40 countries. There they will discuss the latest in the global scrap recycling business and evaluate the state-of-the-art equipment, products, and services used by the industry. April 20, the Institute of Scrap Recycling Industries (ISRI) announced the release of an updated version of ISRI Mobile with enhanced communication features. Users of the iPhone and Android apps will now have the ability to receive customized notifications and more detailed alerts pertaining to the recycling industry. Ontario Tire Stewardship's (OTS) Used Tires Program has reached an incredible milestone: the recycling its 100 millionth tire since the program opened in 2009. To put this astounding accomplishment into perspective, 100 million tires stacked on top of one another is the equivalent height of over 36,000 CN Towers. Before the implementation of the program many of these tires ended up in landfills across the province or accumulated into tire piles, which pose serious environmental and safety risks. Through the Used Tires Program 100 per cent of scrap tires generated in Ontario are recycled into high value, sustainable products - and importantly, no tires are burned, disposed of in landfills or are illegally dumped. CM Tire Recycling Equipment (a division of Columbus McKinnon Corporation) recently supplied a complete turnkey installation – a CM Zero Waste TRR system for one of the most state-of-the-art pyrolysis operations in Europe. The CM Zero Waste TRR system is capable of producing 25 mm wire-free rubber that will be used as feedstock for the pyrolysis system’s reactor. CM says they were chosen to supply this system due to its capability for processing passenger car and truck tires to >25 mm wire-free rubber, along with clean steel, to a purity level of >96 percent.